We've summarized the available Florida adoption forms here and added information for forms that are not published on the Florida Courts' website. You'll notice that the published forms are for stepparent adoptions, but grandparents and other family members wanting to adopt a relative's children are inconveniently left out. Many of our visitors and customers have asked for information concerning these adoption forms. Look through our pages on Florida adoptions. We have several articles that might help you adopt your loved one. Let us know if there is anything you can't find and would like to see on our site. We will do our best to provide the information for you. 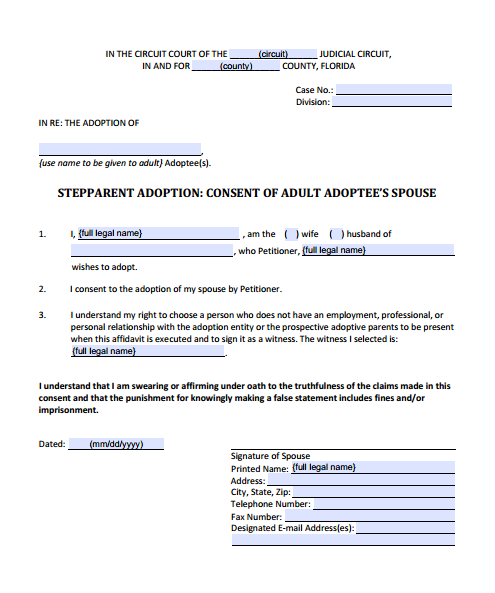 This Florida adoption form should be used when a stepparent is adopting his or her spouse's child. Both the stepparent and his or her spouse must sign this petition. A) the mother of the minor. in the case of an unmarried biological father, he has acknowledged in writing, signed in the presence of a competent witness, that he is the father of the minor, has filed such acknowledgment with the Office of Vital Statistics of the Department of Health within the required time-frames, and has complied with the requirements of section 63.062(2). The name to be given to the children after the adoption should be used in the heading of the petition. After completing this form, you and your spouse must sign it before a notary public or deputy clerk. For more information about the Joint Petition for Stepparent Adoption form, have a look at our page describing the form and the court filing process. Purchase our Premium PDF Fillable Form shown above. Now only $3.50 (Item# IF981B1). Purchase our Premium PDF Fillable Form shown above. Now only $3.50 (Item# IF981B1). The Consent and Waiver by Parent adoption form, 12.981(a)(1), should be filed with the Joint Petition for Adoption by Stepparent, Florida Supreme Court Approved Family Law Form 12.981(b)(1). 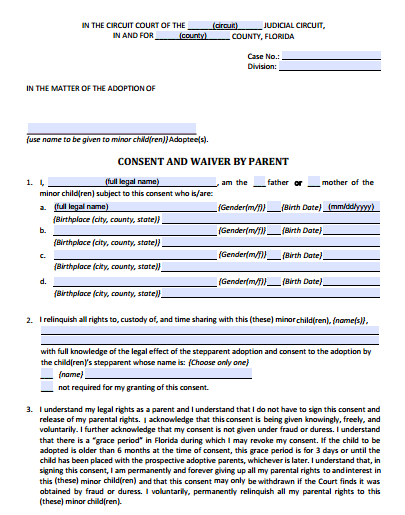 This Florida adoption form, the Consent and Waiver by Parent, is to be completed and signed by the parent who is giving up all rights to and custody of the minor child to be adopted. Refer to section § 63.062 to section § 63.082 of the Florida Statutes for state law in regards to consent to adoption (see sidebar: Florida Adoption Resources). The consent for adoption must not be entered before the birth of the child for it to be valid. For more information about consenting to a Florida adoption and the adoption process in Florida, you should read Chapter 63 of the Florida Statutes. Make sure not to sign the form until you are in the presence of a notary public or a deputy clerk and two witnesses other than the public notary or the deputy clerk. 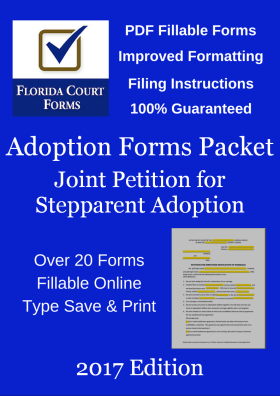 You should file this adoption form with the Joint Petition for Adoption by Stepparent, Florida Supreme Court Approved Family Law Form 12.981(b)(1). After completing this Florida adoption form, you should hand deliver a copy to the parent giving consent and have them sign the original saying they received a copy. Then, you should file the original Consent and Waiver by Parent with the clerk of the circuit court in the county where the Joint Petition for Adoption by Stepparent is filed. Always keep a copy of all the Florida adoption forms you file for your own records. 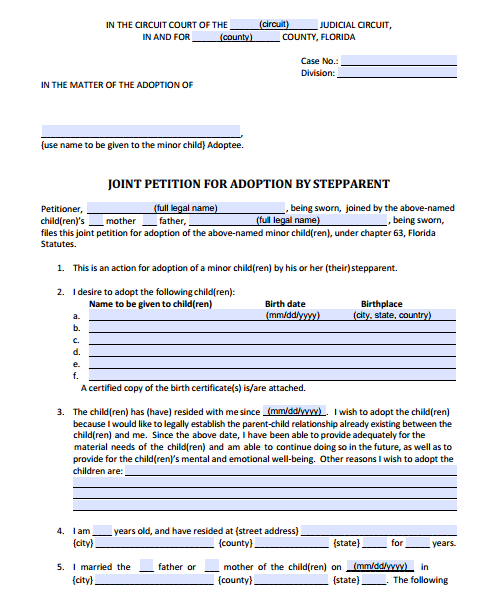 For more information about the Consent and Waiver by Parent form, have a look at our page describing the form and the process for the Joint Petition for Adoption by Stepparent. See link provided above. Purchase our Premium PDF Fillable Form shown above. Now only $2.50 (Item# IF981A1). Now only $2.50 (Item# IF981A1). The Consent of Adoptee form is required if the child is over 12 years old. This form should be filed with the Joint Petition for Adoption by Stepparent, Florida Supreme Court Approved Family Law Form 12.981(b)(1). Refer to § 63.062 to section 63.082 of the Florida Statutes (see sidebar: Florida Adoption Resources), which can be found on the Florida Senate's website, for state law in regards to consent to adoption. For more information about the Consent of Adoptee form, have a look at our page describing the form and the process for the Joint Petition for Adoption by Stepparent. See link provided above. Purchase our Premium PDF Fillable Form shown above. Now only $2.00 (Item# IF981A2). Now only $2.00 (Item# IF981A2). 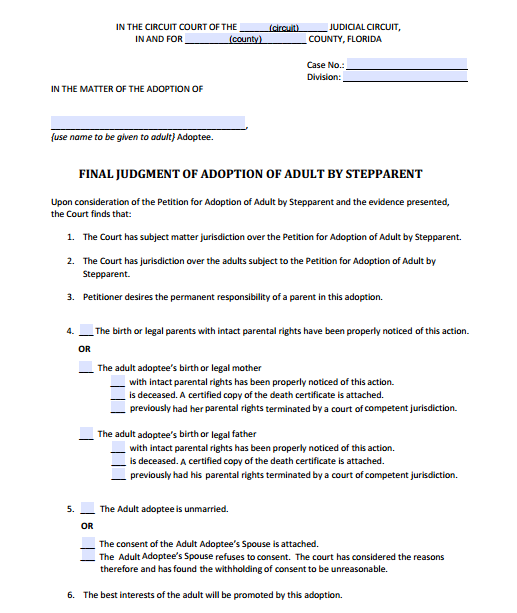 This adoption form should be used when a stepfather is adopting his wife’s minor child and the mother and father of the minor children were never married and paternity has not been established by a valid acknowledgment or court order. 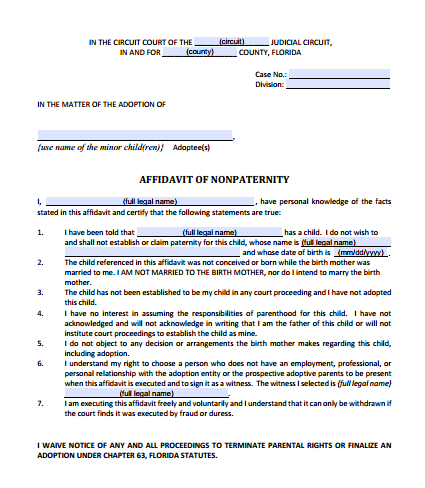 This Affidavit of Nonpaternity may be used instead of a consent form. This Affidavit may be executed before the birth of the minor child. The person signing the affidavit waives notice to all court proceedings after the date it is signed. After signing this affidavit, it may only be withdrawn if the court finds the affidavit was obtained by fraud or duress. 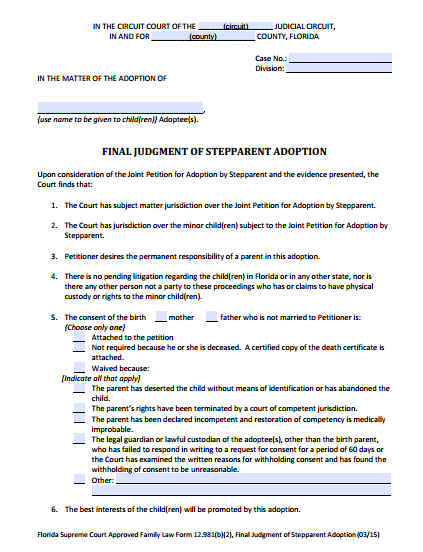 For more information about the Affidavit of Nonpaternity form, have a look at our page describing the form and the process for the Joint Petition for Adoption by Stepparent. See link provided above. Purchase our Premium PDF Fillable Form shown above. Now only $2.50 (Item# IF981A3). Now only $2.50 (Item# IF981A3). 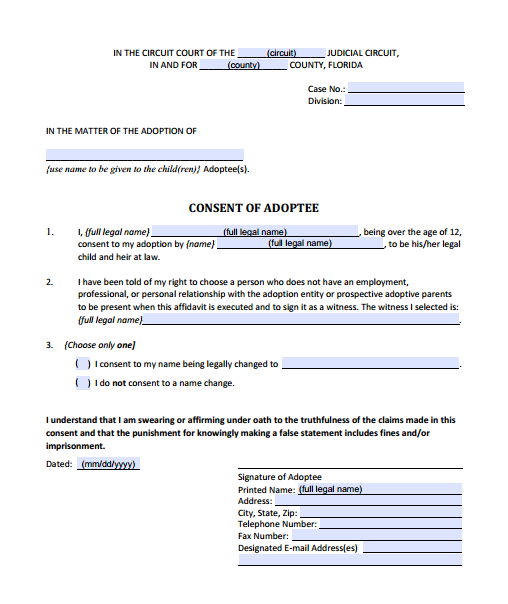 This Florida adoption form should be used when a stepfather is adopting his wife’s minor child and the mother and father of the minor child were never married and paternity has not been established by a valid acknowledgment or court order. This Affidavit of Diligent Search may be used instead of a consent form. This affidavit may be executed before the birth of the minor child. 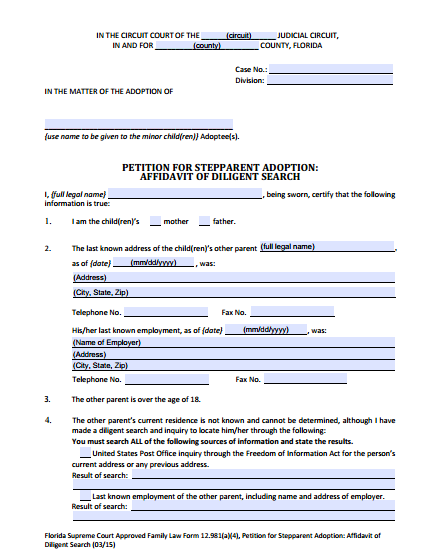 For more information about the Affidavit of Diligent Search form, have a look at our page describing the form and the process for the Joint Petition for Adoption by Stepparent. See link provided above. Purchase our Premium PDF Fillable Form shown above. Now only $3.00 (Item# IF981A4). Now only $3.00 (Item# IF981A4). This Florida adoption form is required for all stepparent adoptions of a minor child. A copy of the completed Indian Child Welfare Act Affidavit form must be served on the other party or their attorney. 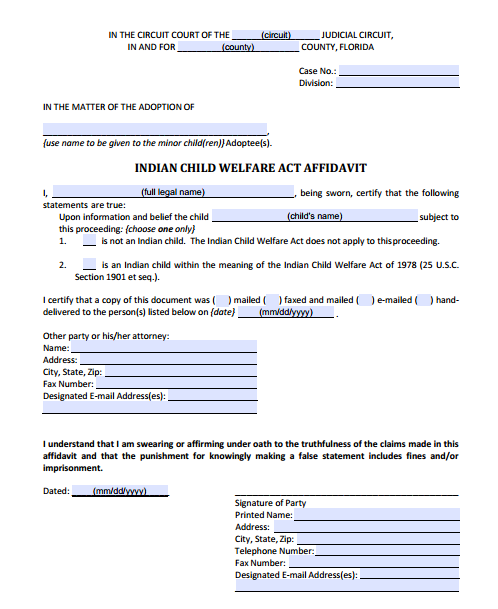 For more information about the Indian Child Welfare Act Affidavit form, have a look at our page describing the form and the process for the Joint Petition for Adoption by Stepparent. See link provided above. Purchase our Premium PDF Fillable Form shown above. Now only $2.00 (Item# IF981A5). Now only $2.00 (Item# IF981A5). This adoption form is required for all stepparent adoptions in Florida. See section 63.054 of the Florida Statutes. 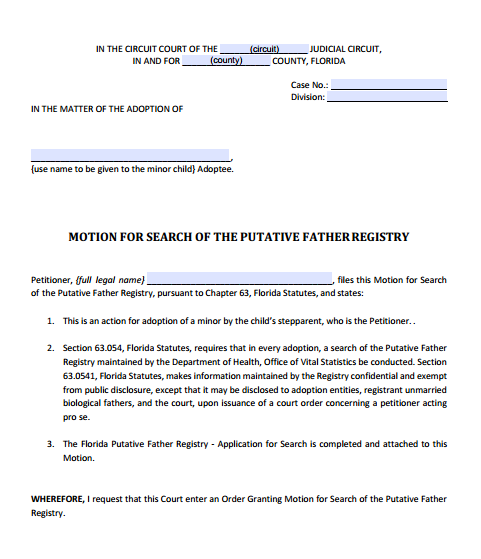 The Florida Putative Father Registry - Application for Search should be completed and attached to this form. Contact the Florida Office of Vital Statistics for the current fee. Check with the clerk or the judicial assistant to see if you need to provide an Order Granting Motion for Search of Putative Father Registry as well. Once your motion is granted, take the order, your completed application, and fee to the Office of Vital Statistics. They will conduct the search and file the results with the clerk of court. You may call the clerk’s office to determine when the results have been filed in order to set a final hearing. For more information about the Motion for Search of the Putative Father Registry, Form 12.981(a)(6), have a look at our page describing the form and the process for the Joint Petition for Adoption by Stepparent. See link provided above. Download our Premium PDF Fillable Form shown above. For more information about the Motion for Search of the Putative Father Registry, Form 12.981(a)(6) form, have a look at our page describing the form and the process for the Joint Petition for Adoption by Stepparent. See link provided above. This adoption form may be required to bring to the final hearing for the judge to sign. Ask the judicial assistant if you need to bring this form. For more information about the Final Judgment of Stepparent Adoption form, have a look at our page describing the form and the process for the Joint Petition for Adoption by Stepparent. See link provided above. Purchase our Premium PDF Fillable Form shown above. Now only $2.50 (Item# IF981B2). Now only $2.50 (Item# IF981B2). 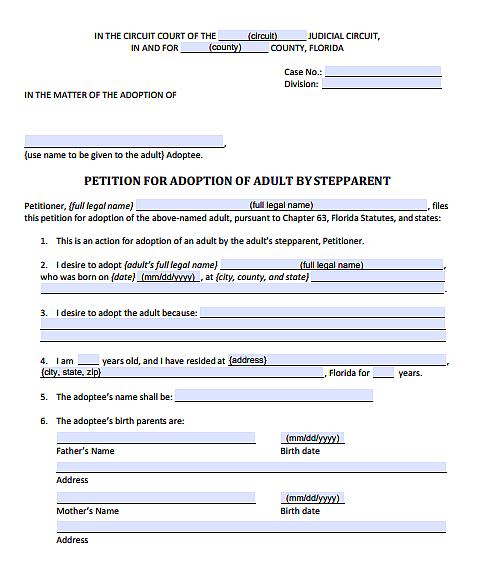 This Florida adoption form should be used when a stepparent is adopting his or her spouse’s adult child. You must obtain the written consent of the adult child to be adopted, as well as the written consent of his or her spouse (if married). This Florida adoption form should be typed or printed in black ink. The name to be given to the adoptee after the adoption should be used in the heading of the petition. The stepparent is the petitioner, because he or she is the one who is asking the court for legal action. You must have your signature witnessed by a notary public or deputy clerk. 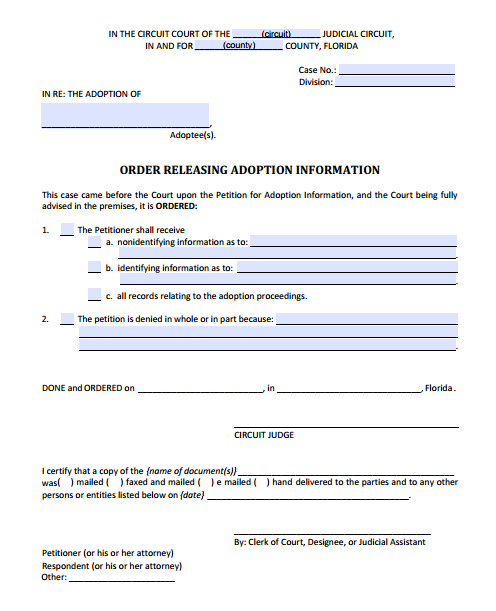 After completing this Florida adoption form, you should file the original with the clerk of the circuit court in the county where either you or the adoptee live and keep a copy for your records. For more information about the Petition for Adoption of Adult by Stepparent form, have a look at our page describing the form and the process for the Petition for Adoption of Adult by Stepparent. Purchase our Premium PDF Fillable Form shown above. Now only $3.00 (Item# IF981C1). Now only $3.00 (Item# IF981C1). After completing this adoption form, you should file the original with the clerk of the circuit court and keep a copy for your records. For more information about the Consent of Adult Adoptee's Spouse form, have a look at our page describing the adult adoption by stepparent process. Purchase our Premium PDF Fillable Form shown above. Now only $2.50 (Item# IF981C2). Now only $2.50 (Item# IF981C2). This Florida adoption form is usually required for the adoptive stepparent to bring with them to the final hearing. For more information about the Final Judgment of Adoption of Adult by Stepparent form, have a look at our page describing this form. Purchase our Premium PDF Fillable Form shown above. Now only $3.50 (Item# IF981C3). Now only $3.50 (Item# IF981C3). 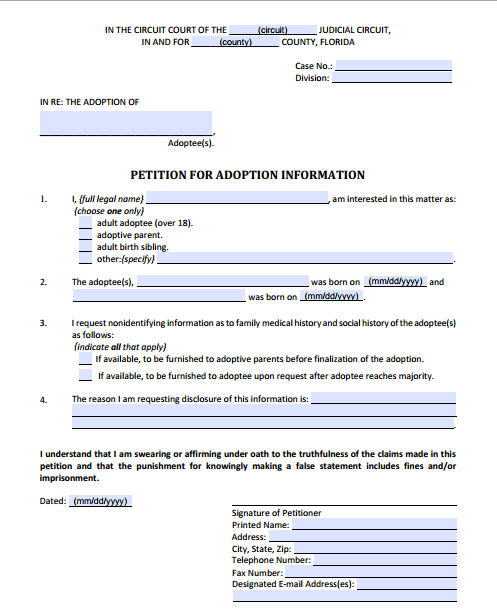 This form is used to request release of relevant medical or social information on an adoptee. You cannot use this form to find out the identity of birth parent(s). Purchase our Premium PDF Fillable Forms shown above. 12.981(d)(1) and 12.981(d)(2). Now only $5.00 (Item# IF981D1D2). Purchase our Premium PDF Fillable Forms shown above. 12.981(d)(1) and 12.981(d)(2). Now only $5.00 (Item# IF981D1D2).